Saying that companies giving in to the digital transformation movement is an inevitable act is definitely a bold statement, but not that far off. With more and more millennials taking over the workforce, the digital revolution gained significant grounds over the years. Tech-centric ideologies soon replaced manual processes and business activities with automated solutions, or are simply facilitated with technology to get them done faster and worry-free. Such as the case with processing payroll. “I love manually crunching in numbers in Excel sheets and spending long hours at work to process payroll” is a phrase that no true blue millennials would ever say. Techie-minded payroll analysts love payroll systems and for very good reasons. It uses technology that improve lives (workers get paid accurately). With a happy workforce due to timely and accurate payroll processing, increase in productivity follows. Even the most stubborn of “old-school-minded” bosses couldn’t help but give in and agree to using automated payroll solutions. Getting paid properly for services rendered evolved positively throughout the years. With each major leap in its evolution, the practice becomes faster and more fair to both worker and employer. The goal of any digital transformation of any company is to streamline and make each process more efficient. For most companies, or if not all, there is nothing else in their business processes that scream “inefficient” more than manual payroll process. If the goal is to attract or retain millennials (or even the Gen Z’ers), automated payroll solution is a major selling point to get or keep them. By all means, digital transformation is not a fad, it is a movement towards a new era that, whether anyone likes it or not, is inevitable. 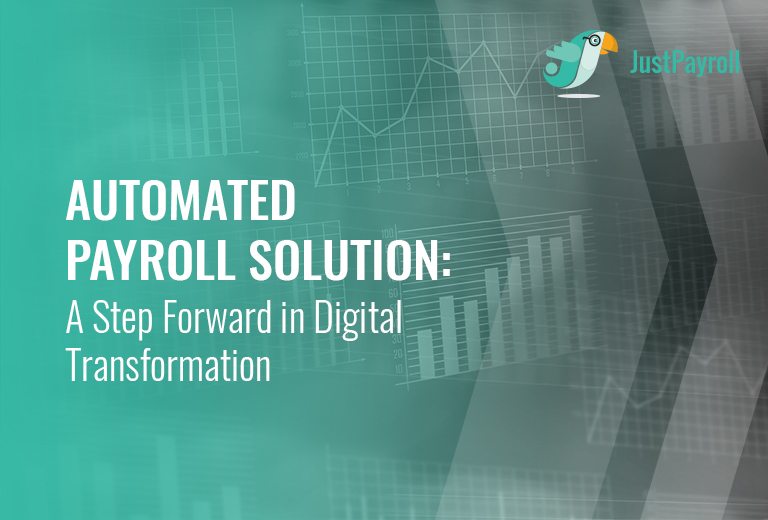 Using automated payroll systems is a huge step forward in the digital age, in which no thriving company could escape from. After all, as that famous line goes, resistance is futile. Manually processing payroll is a long tedious process, but it doesn’t have to… After all, there’s JustPayroll. We provide you with the tools that induct you to the digital age. Learn more by filling out the form below and get a FREE online demo.